The Arab, Gulf people originated from namely Kuwait, Bahrain, Iraq, Oman, Qatar, Saudi Arabia and the United Arab Emirates, speaking their own distinct Arabic dialect. The Gulf Arab people lived primarily along southern edges of the Arabian Desert. They speak Arabiya, or, as it is more commonly known, Gulf Arabic. 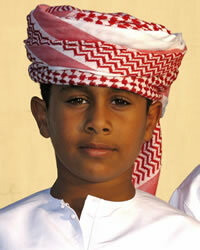 The majority of Arab, Gulf in North America come from Oman. In addition to speaking their distinct Gulf Arabic dialect, they also share a similar culture and music style such as fijiri, sawt and liwa. Moreover, they share an orientation toward the sea resulting in a livelihood of marine industries. Arab, Gulf people are very much like many other Arabs, they value relationships and as such value family and friends. They adhere to Islam. Annually Arab Gulf students travel to North America to study in higher education universities making their mark on schools such as University North Carolina and San Diego State University. Ask God to send evangelical Christians to become friends and share Christ with the Arab, Gulf through both in word and deed. Ask God to work through dreams in order that the Arab, Gulf may experience a personal relationship with Jesus Christ.